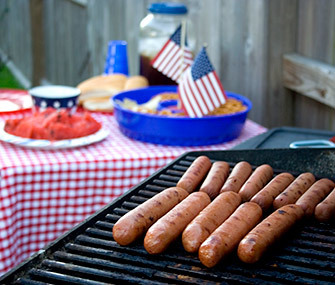 We are a few days away from Fourth of July celebrations, and while most Americans love this holiday, the fireworks, hot weather and array of foods associated with it are not always so good for pets. Here are five tips to help keep your dogs and cats safe and happy during the holiday. Whether at picnics or backyard parties, most dogs will take every advantage to steal food off of plates or scavenge around for anything dropped on the ground. Which is why it’s important to remember that some human foods are very toxic to pets, and rich or high-fat foods, such as cheese, desserts or bacon, can lead to pancreatitis, a potentially lethal condition. Make sure your food plates are out of reach, and if your pet consumes something out of the ordinary, or develops vomiting and diarrhea, see your veterinarian as soon as possible. We understand how easy it is to get distracted when running the grill while entertaining guests, but dogs and cats will be attracted to meat that’s cooking and can burn themselves if they try to snag that burger or chicken leg. Never leave your grill unsupervised around pets. Most areas of the country are hot, hot, hot on the Fourth. Dogs don’t sweat much, so the majority of cooling happens only through panting, which is why they can easily become overheated and suffer from heatstroke. Particularly at risk are overweight dogs, brachycephalic (short-nosed) breeds, dogs with respiratory or hormonal conditions, and long-haired or dark-coated animals. To help avoid heatstroke-related issues, allow your dog to exercise only during cooler times, provide plenty of freshwater and allow at-risk dogs to remain inside air-conditioned buildings during the heat of the day. For dogs spending more time outdoors, consider providing a kiddy-pool filled with water for them to sit in and drink, and change the water daily. Never, ever leave a pet inside a car unattended. Fourth of July can be the perfect time to go camping with your dog. Just make sure your dog has the right flea, tick, heartworm and intestinal parasite control to help protect her from harm. Your veterinarian will know which are the most effective products for your area. Make sure your pet is properly secured when you leave her alone during late June and early July, as I see a lot of patients in my Colorado clinic during this time of year who have escaped their yards. These animals — if found — are brought in suffering from trauma, infectious diseases or trips to the pound that could have been avoided if they were kept secure. Also, make sure your pet’s identification tags or microchip is up to date, check your fences for any weak spots, or, even better, keep your pet indoors. Fireworks can be very scary for a lot of pets. Dogs and cats may hide, cower, shake, pant, drool or have dilated pupils, and they often seek comfort from you if they are scared by these loud sounds. Some dogs are destructive when they panic: digging, chewing on things or even themselves, and putting themselves in extreme danger by bolting or trying to run away from the sound of fireworks. If your dog is afraid of fireworks, try keeping her in a darkened room that is quiet. If you use a crate, then crate your dog when you are away (but leave the crate door open, so she can escape if needed). You can also play music to help mask the sound of the fireworks, and give your pet a food puzzle or long-lasting chewy to help keep her mind occupied. To treat or help prevent fear associated with loud noises, talk with your veterinarian before fireworks season to get any recommendations around medications, tools and training solutions.